On the Home tab, click Restore > VMware vSphere > Restore from backup > Entire VM restore > Entire VM restore. Select the machine that you want to restore and click Entire VM on the ribbon. Right-click the machine that you want to restore and select Restore entire VM. Double-click the VBK or VBM file (for example, in Microsoft Windows Explorer). In the displayed window, select the VM and click Restore > Entire VM. You can use this option if you perform restore on the backup server. 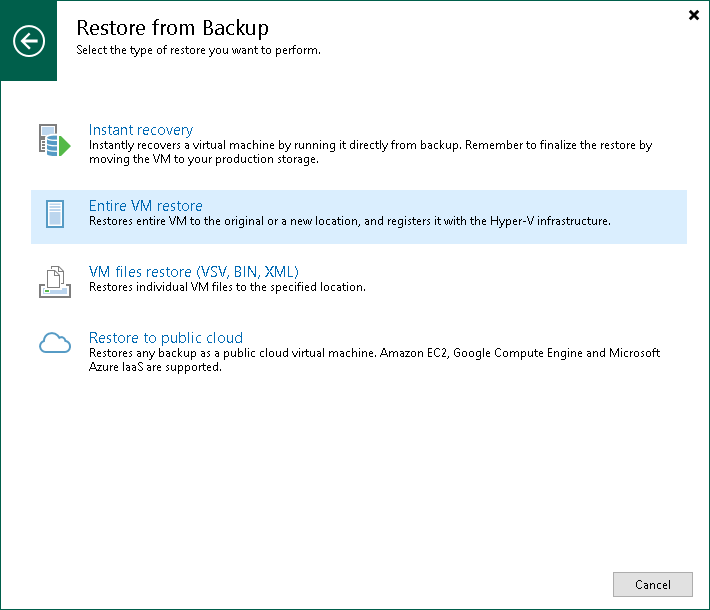 You cannot use this option if you perform restore remotely over the Veeam Backup & Replication console.